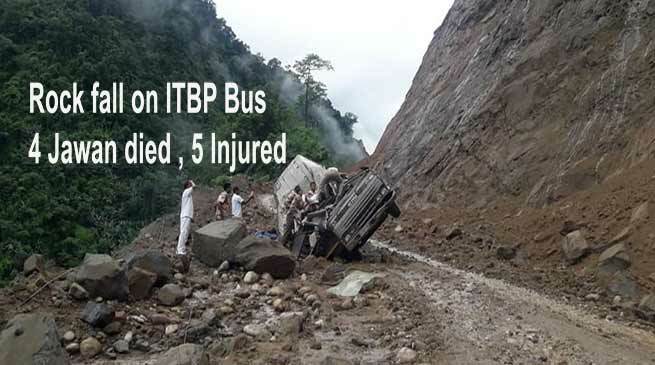 Four Indo-Tibetan Border Police (ITBP) Jawan were killed and 9 critically injured when a huge boulder from hill top rolled down and hit their bus on the Basar-Likabali road in Lower Siang district of Arunachal Pradesh on Friday. DIG (Central) John Neihlaia inform that the accident happened at around 2.30 pm . One ITBP Bus of 49 Battalion coming from Basar and about 5 Kilometre before Likabali check gate a huge rock fall from the hilltop and hit the bus. 4 jawans died on the spot while 9 injured. SP Lower Siang, S. Singpho while informed that all bodies have been retrieved from the spot. The body have been kept in the Morgue while inquest have been done. 9 injured were shifted to nearby Community Health Centre (CHC) the to Military Hospital at Likabali out of which 6 have been critically injured have been evacuated by helicopter to Dibrugarh for further treatment. Singpho said that the ITBP have its 49 battalion headquarter at Basar and the jawans were on its way to Sector headquarter at LIkabali and for further destination, they were travelling in a mini bus having 20 jawans onboard. He said. The deceased have been identified as SI Vijender Kumar, ASI Vinod Kumar, HC Dhanji Yadav, Driver Ct. Raju Kumar while six jawans evacuated to Dibrugarh out of five have been identified as Inspector Mahender Pal, ASI Vinod Kumar Sharma, Ct Alo Raja, Ct Jasdev Kumar, Ct Srinivas. Three injured which are admitted at Army Hospital at Likabali which include two lady constable, while rest seven who receive minor injury are stationed at Transit camp at Likabali. Singhpho added.